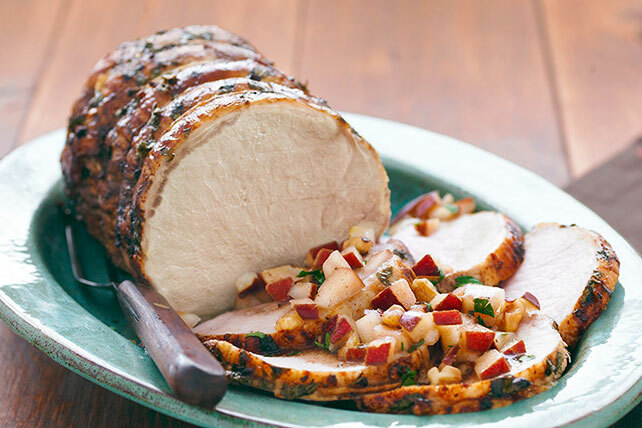 Roast pork loin, so good with any number of fruity glazes, tastes as terrific as you'd imagine with a sweet and savory pear salsa. Combine pears, nuts, crushed pepper, 1/4 cup parsley, 1/3 cup dressing and 1/4 tsp. cumin. Refrigerate until ready to use. Mix remaining parsley, dressing, cumin and garlic until blended. Place roast in roasting pan or shallow baking dish; brush with dressing mixture. Bake 1 hr. and 20 min. or until done (145 ºF). Remove roast from oven. Let stand 10 min. Slice half the roast; serve with half of the pear salsa. Cool remaining meat, then shred and refrigerate to use the next day (with the remaining salsa) to prepare Pork Tostadas with Pear Salsa (see Tip). Pears will continue to ripen after they have been picked. Let them stand on the on the counter until they are ripe. If they ripen before you are ready to use them, store them in the refrigerator until ready to use. Mash 2 drained cans (15.5 oz. each) black beans in large bowl. Add 1/4 cup KRAFT Real Mayo Mayonnaise, 2 chopped garlic cloves and 2 finely chopped green onions; mix well. Spread 2 Tbsp. bean mixture onto each of 8 tostada shells; top each with 1/4 cup shredded cooked pork and 3 Tbsp. pear salsa. Makes 8 servings.